Golf in Ross is attributed to Major W.S.R. Cox and his brother, Captain J.A. 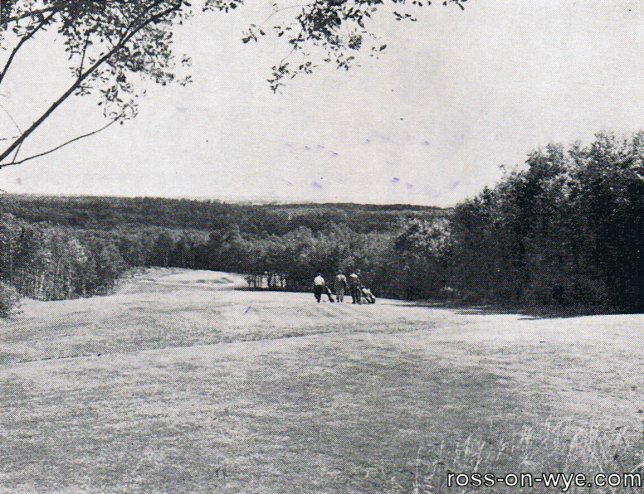 Cox, who, in about 1898, started organising golf matches at Weirend on what is known as the Old Racecourse. 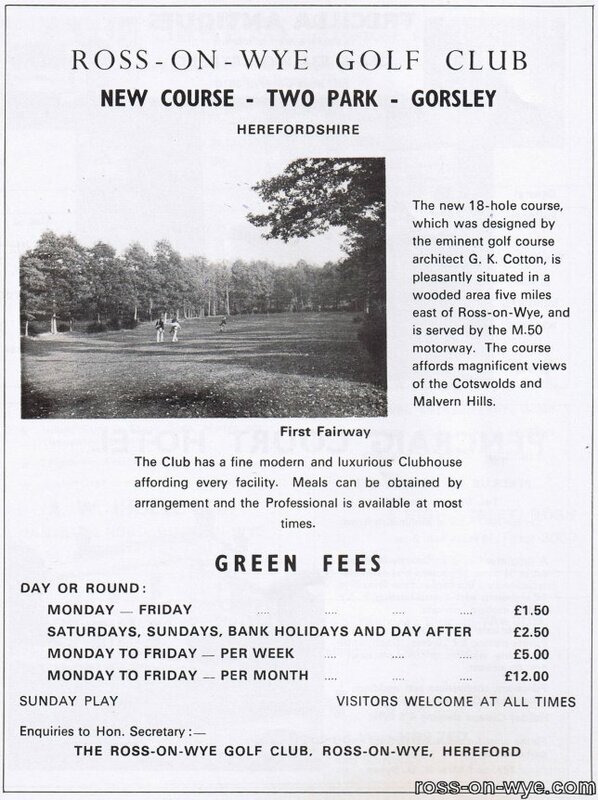 In 1903, with a membership of 80 and as a result of these games, the Ross Golf Club was formed with the Earl of Chesterfield as the President. 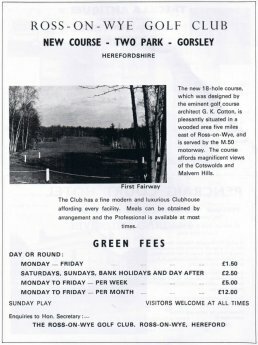 Until 1925 the Club used a course at Alton Court. This course caused the players to cross a railway line twice, climb up to a reservoir 150 feet up and avoid the hazard of the local rifle range. The Club moved to a leased 9-hole course Rudhall in 1925 and the many times Open Champion, J. H. Taylor, came to layout the course. The course at Rudhall had 9 holes and was "acknowledged to be the finest 9-hole course within a wide radius"1. The club house was a transformed water mill serving luncheons, teas and other refreshments. The fees, in 1936, were 2/6 per day, 10/- per week or 20/- permonth with an an annual open prize meeting being held in May. In 1936 the membership was 150 and the Hon. Sec. was I. D. James. By 1949 the membership was 180 (Hon Sec. 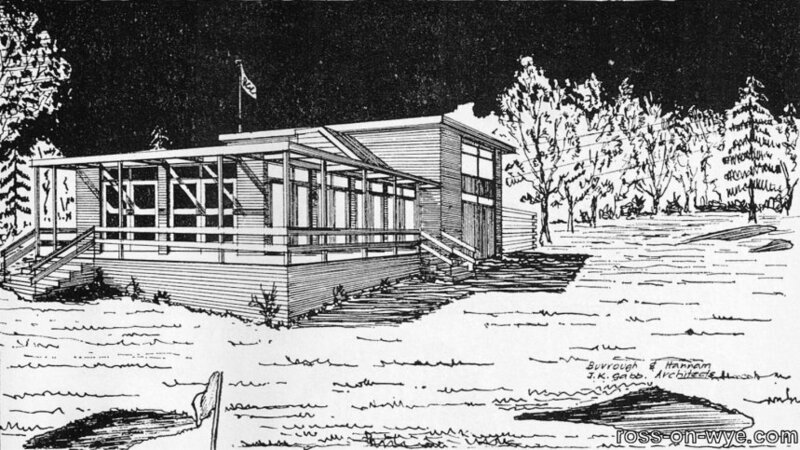 A. D. Dawson) and a new club house had been erected at the highest point of the course. The green fees had risen to 3/6 per day, 15s per week and 30s per month. In 1955 the membership was 200 (Hon Sec S. J. Marshall). 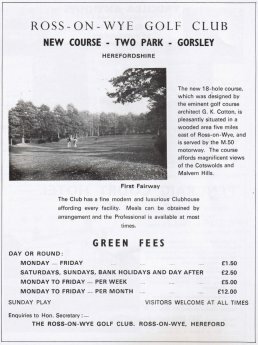 By 1957 the club members began to feel they would prefer a new 18-hole course and it was decided that this should be within the ownership of the Club. After rejecting many sites, in 1961, an option was obtained on land at Jays Green. 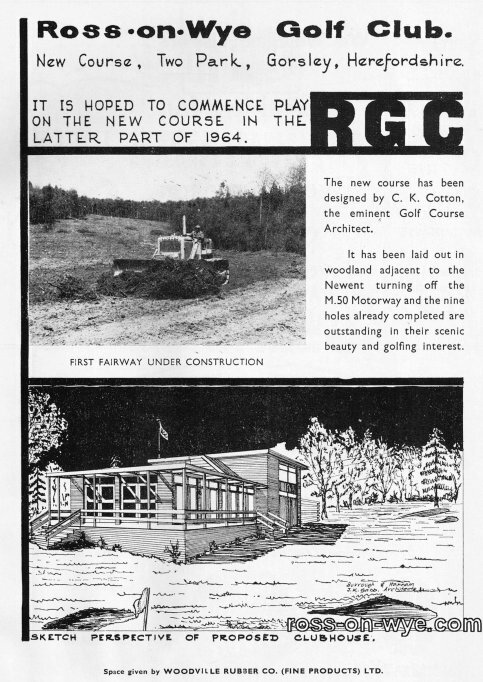 The well-known golf architect, Mr C. K. Cotton, warned that the wooded site would be difficult to transform/ But in spite of this he prepared several alternatives and agreed to be the architect. The building of thecourse and club house was supervised by a Sub-Committee and to be carried out by club members with the grass seeding and cultivation carried out by members who were farmers. The work cost around £42,000 with a saving of around £33,000 over the cost of using a building firm. Half of the capital was provided by members' loans and debentures and the remainder was found by grant from the Central Council of Physical Recreation along with a long-term loan negotiated through the Ross and Whitchurch Rural District Council. 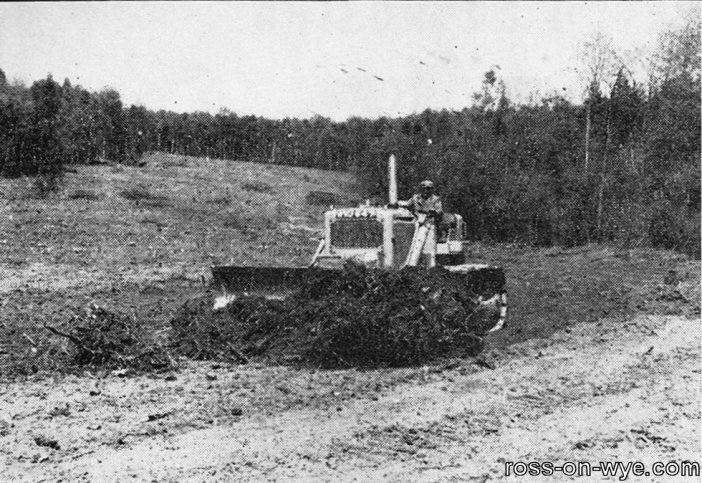 Permission for the building works was given in the Summer of 1961 by the Autumn thousands of trees were cut down in readiness for the bulldozers to move in to clear the roots and stumps to shape the fairways and greens for the first nine fairways. 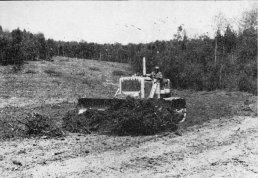 The first nine greens and tees were seeded in the Autumn of 1962, the fairways took place in August 1963 and also saw preparations for the second nine holes. The Club played its last match on the Rudhall course in July 1964 and on the 1st August 1964 the Club President, Col. J. F. Maclean HML JP, officially opened the first nine holes and the wooden Clubhouse. 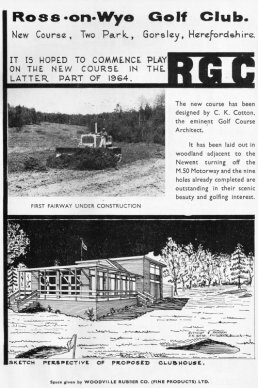 In late 1963 final approval was given for the construction of the new Clubhouse and two years later, in June 1965, Mrs Maclean opened the building on behalf of the President. This was a fine two-storey building, with a veranda, giving splendid views of the ninth and eighteenth holes and formed a real focal point for the club. 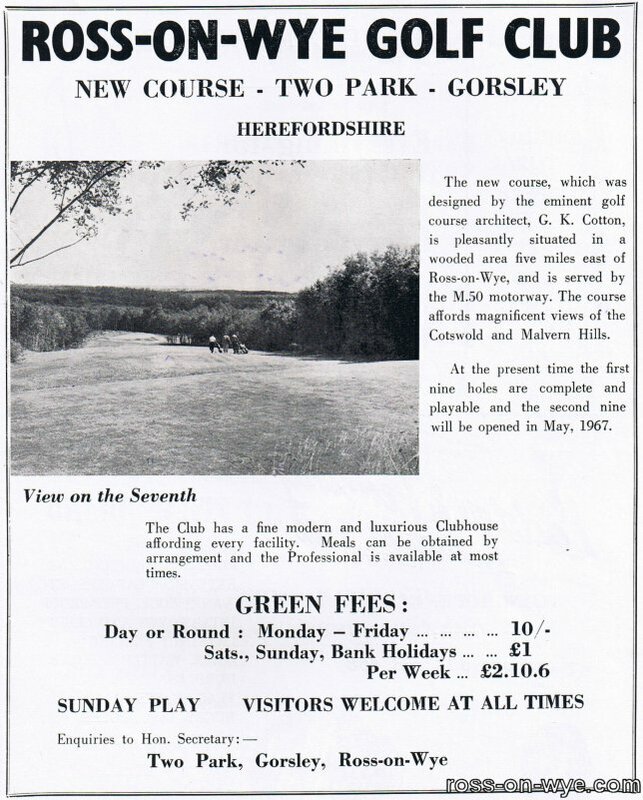 The course was officially opened by Mr. J. J. E. Pennick, President of the English Golf Union, on 7th May 1967. It had a completed length of 6,451 yards over the 18 holes with three par three holes, three par five holes and the remainder being par four; the tree-lined fairways required premium accuracy. This resulted in the course having a Standard Scratch Score of 73. Since then the club has added practice facilities with putting, chipping and pitching facilities close to the club house and a driving range providing the opportunity to practice the long game. More recently the club has been advised by Donald Steel, the architect for many famous courses including the redesign to championship standard of the Jubilee Course at St. Andrews. More details on The Ross-on-Wye Golf Club can be found at http://www.therossonwyegolfclub.co.uk/. Since then a number of other golf courses and driving ranges have sprung up in the area, and with the Ryder Cup being played at Newport in 2010, then the popularity of the courses in the area can only increase.